This year, DWW-SBSM volunteers participated in a multi-organization “care package making” event. They made over 200 packages, which will be going to individuals experiencing homelessness in the Santa Barbara area. Every November on a day known as Mitzvah Day, organizations within the Jewish community undertake a volunteer project to serve their local community. “Mitzvah” is the Hebrew biblical term for “commandment” or in contemporary English, “good deed”. 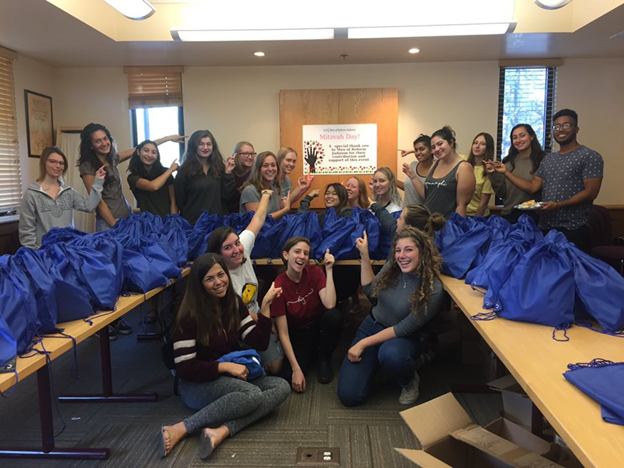 On November 18th, Santa Barbara Hillel, UCSB Community Affairs Board (CAB), and Men of Reform Judaism (MRJ) collaborated to set up a care package making event to commemorate this day of giving. Santa Barbara Hillel graciously extended an invitation to DWW-SBSM to not only be the recipient of the care package donation but also to join in on the fun of putting them together. The care packages included toothbrushes, deodorant, nail clippers, feminine hygiene products, hair combs, hand sanitizers, shampoos, conditioners, granola bars, and many more items. One of the most important items in the care packages were socks, which are considered “white gold” on the streets. Not many people are aware of how important socks are to the homeless community: they add an incredible amount of warmth, yet easily get worn out from all the walking many of our patients have to do to get to places every day. Socks are always asked for and in very high demand. If you are thinking about making a donation, please consider donating socks. At all DWW clinics, we provide both medical care and hospitality items (such as socks) for our patients. Santa Barbara Hillel, CAB, and MRJ will be donating the 200+ care packages to DWW and we will be passing out the packages throughout December. Leilani states that “these items will be especially useful and appreciated” throughout the winter season. It was a successful Care Package Making event and we can’t wait to participate again for next year’s Mitzvah day!